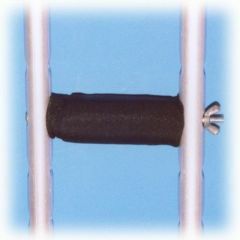 Crutch Tips - 7/ 8"
Crutch-Mate Crutch Hand Grip Pads are made from a high glycerine gel designed to prevent hard spots. Pads will help prevent friction, reduce chance of skin breakdown and provide long lasting comfort. The gel breaks down fast if you are a long time user like me. After about two weeks, you need to start looking for your old handles to put them back on. Supports Weight. Lightweight. Easy To Use. I'm on crutches 100% of my time. The crutch mate hand grips helps keep the blisters down. I highly recommend this product. This item slips and can cause you to fall. Easy To Use. Safe. Well Constructed. Stores Easily. Supports Weight. Lightweight. I could tell little difference between this product and the gray hand grips that came with the crutches. The potential is there as the underarm pads were great. Product needs a little work and you would have a winner. Safe. Well Constructed. Supports Weight. Stores Easily. Easy To Use. Lightweight. Wet Weather. Outdoors. Short Distances. Indoors. Long Distances. These are great! Unlike the traditional foam pads, these are not sticky, are easy to clean, and do not break down. They provide excellent cushioning, and even when it is wet these are not damaged and still work well. I use crutches permanently and I love these - they enable me to go long distances with comfort. But do not buy these products from Allegro - their return department is terrible - they refused to give me a return authorization number for items within their return guidelines and "could not find' another return.